Ellen’s parents decided that for their summer vacation they’d visit Japan. Japan had been a long time vacation hotspot on their list but now was the right time for it to have come. If it were not Japan Ellen’s parents would’ve gone to the Caribbean. They’d visited the Caribbean several times before and Wire Dog liked the hot sun and the white sandy beaches. He remembered being in Jamaica for the summer the previous year and he had a great time there. Wire Dog also met loving people at the five star hotel where the family had stayed. Out of all the Caribbean countries Wire Dog had visited he liked Jamaica the best because he saw the fastest man in track and field Usain Bolt who ran and beat every other athlete on the racing track in the capital Kingston. Wire Dog liked racing especially track and field a lot. Ellen was very excited about their vacation which would be in just three weeks. During that time Ellen received money from her parents to buy stuff to take for her and Wire Dog for their trip. Ellen visited the mall’s clothing stores where she bought summer clothes for Japan. Wire Dog wanted to get some cool coats but Ellen reminded Wire Dog that it would be hot. Wire Dog sighed but Ellen promised that he could still get them for Christmas and so he was happy and wiggled his tail. Ellen bought a digital camera as well so that she could take photos in Japan of herself, family, Wire Dog and the country. Wire Dog dreamt constantly of the trip and got more and more anxious each day. 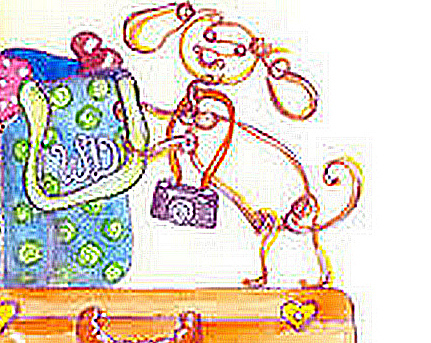 Ellen’s parents packed their suitcases and even a little one for Wire Dog. Everyone knew Wire Dog from his super hero performance in New York City where he entered a burning building and saved a baby. Wire Dog’s photo was all over the local newspapers and the T.V. stations. Wire Dog was always brave but from that incident he realized that he was special. The day finally came for them to leave for the airport and everyone was up early for the flight. A family friend drove them to the San Francisco International Airport since they were living in that area. The flight to Tokyo, Japan would require them to stop in the United Kingdom. At the airport everyone checked in with their flight and several people were excited to see Wire Dog. Some folks even took pictures of themselves with Wire Dog. On the plane Wire Dog looked out the window and wondered how they could be so high up in the sky and not fall down. Wire Dog decided to be a physicist when he grew up or even an astrophysicist because he wanted to know how gravity, mass, space, time, and planets worked. Wire Dog had quite an imagination for his age. After several hours, the plane finally arrived in London, England and Wire Dog was sure excited. He wondered why the people of Britain sounded so different from those in the U.S.A but Ellen told him that these people spoke with a different accent and that’s where the original English came from. Then Wire Dog understood, but only a little better. The British people were happy to have Wire Dog in their midst and that made Wire Dog feel as though he was the King of England or at least some royal official. Ellen and everyone quickly boarded their flight to Japan and this time there was no stopping. The flight took another several hours and when they reached Tokyo it was early in the morning. Everyone was exhausted. Wire Dog felt as though he hadn’t slept for decades. Ellen and her family stayed at a hotel in Tokyo. Wire Dog slept and slept, then he got up and watched television. Wire Dog watched Japanese cartoons which are called Anime. Ellen’s parents called her and Wire Dog and gave them the good news that they were going to the Summer Olympics in Tokyo. Ellen and Wire Dog were excited. Wire Dog loved sports and he imagined swimming, playing basketball, soccer, and competing in track and field. The trip would be the next day and when morning came, Ellen and Wire Dog were up very early. Wire Dog felt proud. Then he took a walk over to the warm up area and saw Usain Bolt lying down almost as though he didn’t want to compete. Wire Dog went over there and made a ruff as if to say ‘Get up and train!’ Usain looked with me!’ Usain understood and he got up. Wire Dog took off running and Usain tried to keep up, which help him prepare for his 100 meter final later that day. Usain thanked Wire Dog for helping him get motivated. Suddenly Ellen came and found Wire Dog helping the athletes to train. Ellen knew it was typical of Wire Dog’s personality to always want to help but she patted him on the back and said they better get back to their seats in the observation stands. So Wire Dog barked his goodbye and good luck wishes to everyone. Wire Dog and Ellen returned to their place in the stadium to watch the swimming races. Soon they saw Ann, the swimmer representing the United States in the 100 meters Breaststroke and she looked confident. When the race was over she came first. The reporters at the Olympics asked her who helped and trained her before the race and she said it was Wire Dog and everyone was surprised. Wire Dog received several cheers. Before long it was time for the track and field events in another area, so Ellen and Wire Dog found seats near the front. It was the Men’s 100 meter race and Usain Bolt was in it and Wire Dog was glad. Bolt looked confident and Wire Dog looked like the typical coach. “On your marks, get ready, set. Go!” said the Announcer as Ellen and Wire Dog held their breath. “A new world record! Wow! 9.48 seconds!” “ Unbelievable” said the Announcer. The crowds cheered and were happy. Everyone celebrated. The journalists ran to interview Usain and asked what led to this surprising, new World Record. “The pressure of the Olympics was a bit overwhelming for me earlier, but then I met Wire Dog and he helped me to train with his special technique. I don’t think I could have done it without Wire Dog’s timely encouragement,” replied Usain. The journalists then all rushed over to where Ellen and Wire Dog were seated and surrounded them with microphones and a series of anxious questions. Once again Wire Dog became a world hero for helping athletes at the Olympics in Tokyo. Ellen was happy. Ann was happy, Usain was happy and Wire Dog was happy too. Everyone in the national stadium of Japan celebrated with Ellen, Wire Dog and the athletes. The local media picked up the story and broadcast it around the globe. Soon everyone in the whole world was talking about this special little dog. That night Wire Dog went to bed tired and happy, but enjoyed dreaming about all the things that had transpired on that special day at the Olympics.